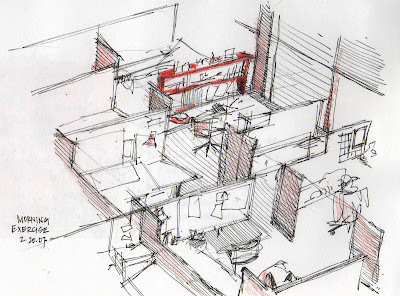 This morning's "exercise" consisted of another stab at drawing 3rd floor cubicles from the 4th floor balcony. I'm not very pleased with this drawing, mainly because I find it difficult to read. I think changes in line weight and value would have helped, but I would also appreciate any other tips you might have for how to delineate such a complicated space more clearly. that's really a nice drawing though! I might suggest that all walls of the same angle could be colored in solid the same color, maybe instead of using the diagonal lines you've used for shadowed walls, they could all be solid (dark) color and it would give the eye a place to rest as well as recognize easily what it's seeing. You could even use that shadow color's compliment for the light walls that would be adjacent. But either way, maybe having a solid tone instead of running lines might make this easier to recognize. suzanne that looks a real complicated place for sure. what about a uniform colour for the carpet, even if that is not true, a real colour - green for example. A friend and fellow storyboard artist once shared with me a technique for clarifying loose, semi-complicated drawings. He suggested simply using a slightly heavier line on the underside of all the objects (or the side away from the light source - usually the underside). I was skeptical, but tried it and it worked surprisingly well. I have to say again how much I enjoy seeing your work, btw. Very natural and easy to look at.